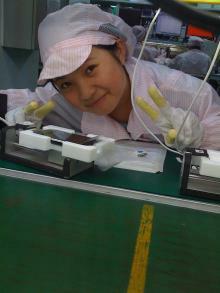 China.org.cn reports on the photos posted to our forum last week of a Foxconn factory worker. Forum user markm49uk had found the photos on his brand new iPhone. "She is definitely not fired," an unidentified representative from Foxconn's factory in Shenzhen, southern China, told the newspaper Xiandai Kuaibao. The representative did confirm that she was an employee at the Shenzhen factory and that it was likely that the test photos were left on the iPhone's memory "accidentally". Thats brilliant! I think it would be great for every Chinese worker who makes your iPhones to take a snap of herself or her factory friends. Build bridges, make connections, a hello from a person you would never otherwise meet. Globalisation in practise. Too bad, what a shame.... She was really cute too. I'm not quite sure why she should be fired. These phones have to be tested before they're finished. That means that at least one picture has to be taken. The odds of a one-in-a-million bad memory wipe are not unlikely. And I don't think there's a 'code' that says what image you can and cannot test the camera lens with.